A little roster news this afternoon to break up the mid-week monotony. Per the Lincoln Stars' Twitter account, the team has acquired defenseman Connor Frantti ('94) from the Muskegon Lumberjacks. In return for Frantti, the Stars traded a 7th round pick in the 2014 USHL Entry Draft. Franti is a big kid, coming in at 6'6", 203 pounds. He is originally from Spring Grove, IL, and has committed to play college hockey at Northern Michigan University, starting the fall of 2014. 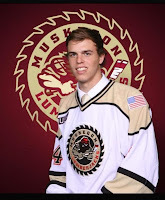 Frantti was originally drafted by the Lumberjacks in the 16th round of the 2013 USHL Entry Draft, and only played one game with Muskegon this season before he was traded. In that one game against Team USA on 9/27/13, Frantti had no points and was +1 in a 5-4 Muskegon win. In five preseason games with the 'Jacks, Franti had no points, was -1, and accumulated 21 penalty minutes. 19 of those 21 PIM's came in one preseason game against Cedar Rapids. 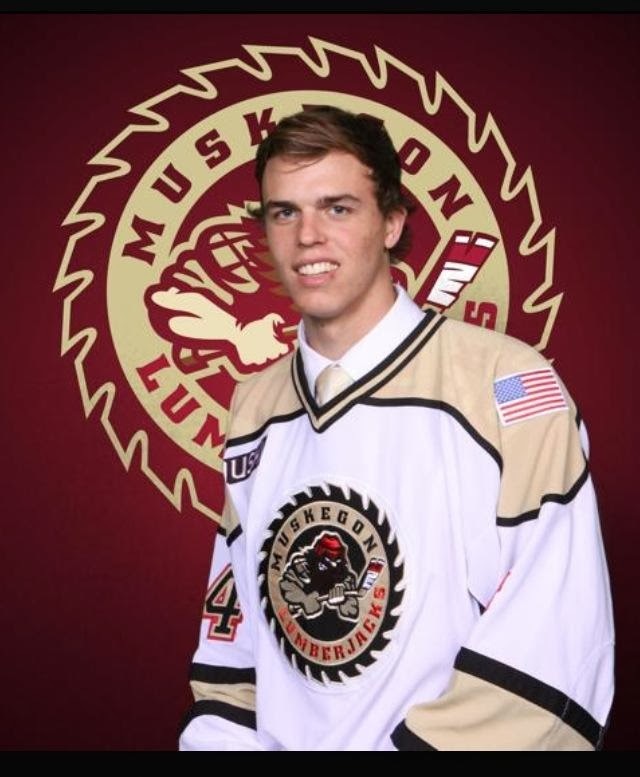 Before getting drafted by Muskegon, Frantti played hockey at Culver Military Academy in Culver, IN. That's the same program that has produced former Stars such as Michael Sdao, Cory Hibbeler, David Gerths, and Andrew Schmit. Interesting trade, in my opinion. The Stars were already set with 7 defensemen before this trade, so it would seem that with 8 d-men on the roster, more player movement could be coming. I suppose the coaches still could keep 8 defenseman on the active roster, but most seasons only 7 are protected. We'll have to wait and see what happens with that. Thoughts on the trade? Please leave a comment below. Edit: According to the Poinstreak roster, the Stars have released forward Nick Monfils. I assume this was done to make room for Frantti. I've since been told that Monfils is on his way to Corpus Christi (NAHL). Best of luck to him going forward. I was a fan of his speed and skill. just curious, but since we picked up a player doesn't that mean we have to let one go?? ?any word as to who that might be? do you think this is because maybe the coaches feel like we're getting pushed around a bit to much on the ice? trying to add some muscle? Size is fine, as long as it comes with discipline. Just my uninformed opinion, but I really like the way the guys have been playing, a little less banging in the corners and more speed. Don't get me wrong, playing physical can be fun to watch, but seems that in years past it's lead to more time in the penalty box. All the same, welcome to the Ice Box Connor and good luck to Nick in Texas. I have since edited the article. Forward Nick Monfils has been released. I assume it was done to make room for Frantti. Good question. I can't speak for the coaches but I haven't had the impression that the team was being pushed around so far this season. That's just my opinion, though. Maybe the coaches felt the team needed to get bigger and tougher? I agree. It's been nice to see the Stars stay out of the penalty box. I still think you can play physical hockey without going to the sin bin every other few minutes, but it's a fine line. It seems like the Stars have been doing a good job of playing smart hockey, which has been appreciated by this fan. It seems that this team wants to be more finesse and lacks the ability to actually finish a check...kinda seems like we only have two kids (frye and pittman) that would drop the gloves...prime example would be vs des moines they seemed to be taking shots at hoff...and even injured him for a little bit but no one seemed bothered about it to have his back....this could result in the lower pims...also is it really this hard to be more then medicore on the powerplay every year? Nick Monfils has speed and skill it's to bad he wasn't given enough time to prove he can play with the team. Word has it that Nick is going to Texas to work on a few things the coaches left him with. I hear that within the next month if everything plays out well he will be back with the Stars. Having coached Nick I know the kind of kid he is and I know that he will be motivated to be back as soon as possible. I am a little disappointed that he wasn't given a long opportunity to showcase his talents.